Newest Random Apparition – Napo B "Live"
The Grey Pink Ghost Woman, was created with prepared rollers, in less than twenty minutes last week. I still don’t know if I will keep it like this, she suddenly appeared on the panel and I had to stop and contemplate who this woman from the forties or fifties was or could have been or where she came from. 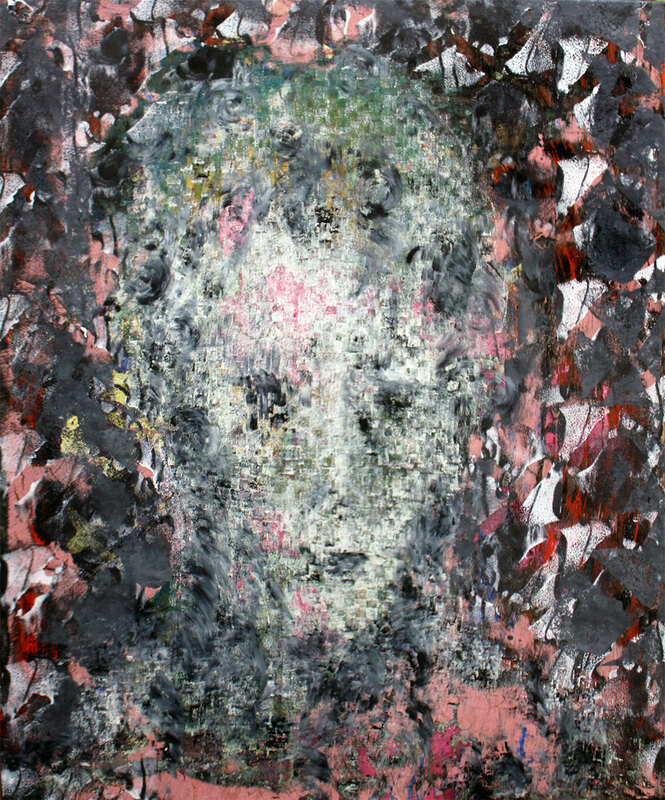 Along with all my other random ghost paintings I am considering using facial recognition software in order to attach a possible identity to the face. Conceptually I have considered how on random portrait might produce an exceptionally long list of names associated with one painting. I’m on it. Wonderful painting. I wish I was as active as you – experiencing a block at the moment. Hi Steve,maybe I should introduce you to the randomness of roller painting. Meditative and full of surprises. I like that idea – we haven’t done anything together since a one inch square dry point around 1975. A friend gave me some half rotten antique rubber paint rollers for borders and painted “wall paper”. The half rotten part certainly increases the randomness. love this painting. She is the 50’s epitome, the perfect pinks, I see her in rollers, It is amazing to me the way you do this. Channeling these images entities and spirits in paint. Others speak about it, or sing about it, you make them flesh in paint.